As ways to wrap up a photoshoot go, this is an odd one. True, across seven years of crankandpiston.com, we’ve had our fair share of run ins with jobsworth security guards and the occasional police cruiser with a speed gun. But being flagged down by a UH 60M-Blackhawk military helicopter is new. Perhaps a little context. It’s 8am, and we’ve just set off for a shoot in the 2015 Corvette C7 Stingray convertible. Having already driven GM’s banner sports bruiser in both the US and on home turf, we’ve been immensely impressed with the C7’s performance. Initial fears that the ‘Stingray’ badge was just a cheap marketing ploy to push sales proved ungrounded: unlike its illustrious but poor handling predecessors, the new seventh generation Corvette was powerful and looked the cat’s frightened whiskers, but was also surprisingly handy through the turns. 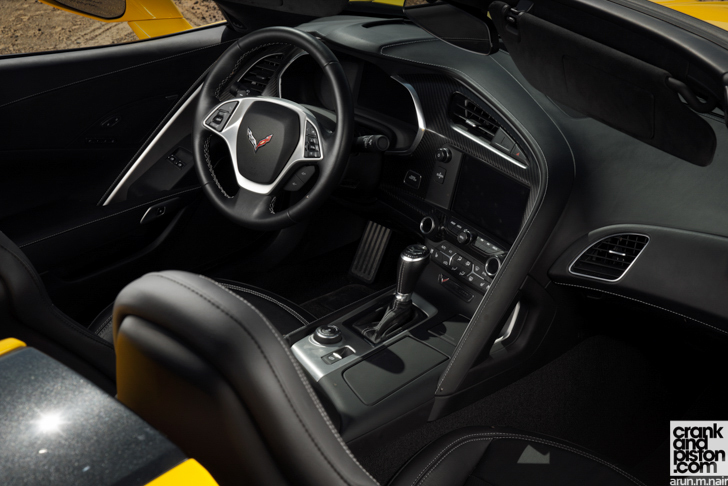 Far from being ‘just another’ powerful American sports car, the Corvette offered a visceral driving experience closer to the Porsche benchmark than ever before. The automotive world took note. As did we when the new convertible Stingray landed in the Middle East. Convertibles by their very nature (with possibly McLaren’s 650S and 12C as notable exceptions) rarely match their hardtop alter-egos in terms of performance, the added weight of a fold-top roof and modifications to the chassis making the cabriolet – no matter how performance-hewn – softer by comparison. For mainstream models, rarely put to tyre-squealing use and not overly affected by a loss of structural rigidity, it opens doors to a whole new audience. For sports car enthusiasts, it’s a red flag. 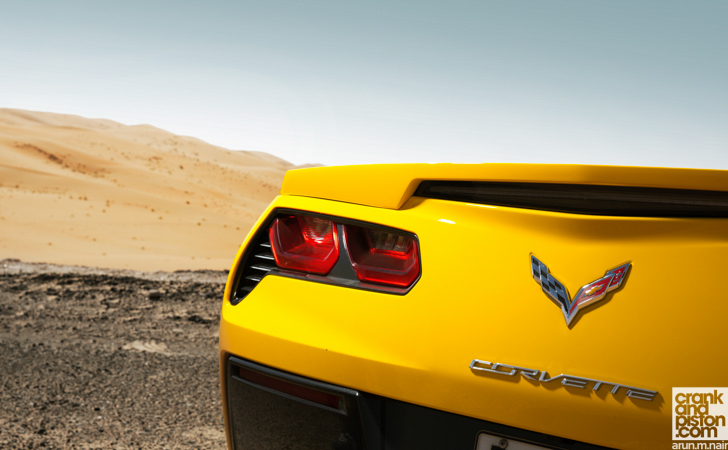 To find out which group the new convertible Stingray belongs in, a driving road was required. But not just any road. The road we had in mind required 350km of constant highway driving, a near eight-hour round trip, and – at the end of all that – nearly 10km of the finest winding asphalt the region had to offer, in Tal Mireb just south of Liwa in Abu Dhabi. Across one epic day, we would discover whether the convertible C7 Stingray was still a bone fide sports car or a missed opportunity. And, as it turns out, just how close our photoshoot was to a military base. Just under one hour into our voyage, we pull over to brim the tank and chow down at possibly the world’s most expensive picnic table: the lack of a sloping roofline means the rear end of the convertible is almost completely flat. Corvette purists amongst you can rejoice though since little has changed in the design. Though I’m more partial to the oddly named ‘Torch Red’ paint finish, our Really Very Yellow test model still looks the part, the louvred bonnet – complete with ‘functional hood air extractor’ – teasingly hinting at the 455bhp 6.2-litre V8 lying beneath it. The angry, angled headlights remain at the front, the dual style taillights and taillip spoiler stay put at the rear, while the Stingray emblem and air intakes are front and centre on the front wheel arches. The big difference maker is the new fabric top, which unlike the targa-esque roof panel found on the Stingray can be opened and closed fully, and at up to 50kph albeit at a slightly lethargic 21 seconds. That the black roof matches the 19-inch alloy wheels is a neat addition too, as is the option to lower the roof remotely via the key fob that we demonstrate to several enthusiasts who’ve come over for a closer look. Certainly the new convertible hasn’t lost that Stingray head turning appeal. With food and caffeinated beverages demolished – and memories of crankandpiston colleague AJ’s almost surgical precision when buttering his pancakes now with me for life – the fury of GM’s V8 and 460lb ft of gutsy torque mean we’re back up to highway cruising speeds quickly, the three hours that lie ahead giving me ample time to mull over my surroundings. And once again, there’s little change between the hardtop and the convertible. The seats are stiff and supportive but not uncomfortable: I manage to survive the entire day without nerve endings spasming uncontrollably. The minimalist number of buttons and rotary dials makes the infotainment system easy to navigate, and even though the convertible comes equipped with SatNav, I prefer to let our camera car on point take on navigation duties. There is though a distinct lack of headroom, which I remember being more cavernous in the hardtop, and there are a few too many plastic-ky panels in the ‘fighter jet-style cabin than ideal. My prime irritation however comes from my fellow motorists, and in an effort not to get too wound up by the tailgating bell-ends that seem to be ten to the dozen on the roads today, I amuse myself by going through the driver information screen, my inner eight-year old immediately making a beeline for the G-Force reader. I make a mental note to see if I can break 1 lateral G later in the day. Through Dubai and into Abu Dhabi heading for Liwa City, almost 97 per cent of the roads our convoy travels along are tragically straight: I muse, with cruise control set and no real steering input required, whether I can get away with a nap for an hour or two. The more uneven road surface answers this question for me, however. So far to get the full timbre of that thundering V8 soundtrack on the highway I’ve been cruising in Sport driving mode, but the crumbling condition of the tarmac means I’m soon abandoning this setting for Tour, the softer suspension configuration I’m hoping will preserve at least a few of my vertebrae before they turn to dust. I’m even tempted (in a Corvette of all things) to shift into Eco and preserve my already impressive fuel economy. At cruising speeds in Eco, butterfly valves close and the V8 effectively runs on four cylinders until aggressive acceleration is called for. Rattling our way through a perilously narrow roadwork setup, we – mercifully – begin to leave Liwa City and its monotonous road network behind. 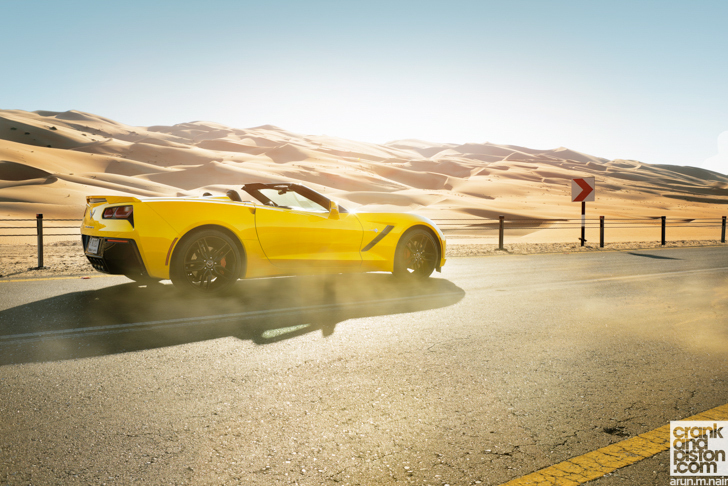 Life’s too short to describe the ‘drama’ of that run in great detail, but the effectiveness of the convertible’s brakes do come into play at one rather nerve-jangling moment: so engrossed is an SUV driver in the Stingray – and the selfie he feels compelled to take with it from his driver’s seat at 120kph – that he fails to notice his lane feeding into mine until the last moment. Cue a torrent of expletives from the open top Corvette and a thumbs up from Mr SUV, happy with his photo and seemingly none the wiser to our near-collision. It’s reasonable to wonder why we’re putting ourselves through this. Indeed, we begin to wonder ourselves until the urban-affected beige sands start to morph into a stunning shade of golden yellow as we begin winding our way back into the desert at Tal Mireb. Dual carriageway becomes single lane, traffic starts to thin, and the road begins undulating heavily with the topography of the area. As we crest a vast hillock, the road disappears sharply into the valley below. Off in the distance, the dunes continue for what seems like an eternity, and in-between lies kilometre after kilometre of sinuous tarmac with scarcely an oncoming car or speed camera to spoil the run. After hours of straight-line highway driving, it’s time to let the 455bhp convertible Corvette off the leash.